FUR: As per Mini Rex Standard. 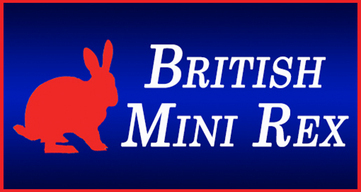 TYPE: As per Mini Rex Standard. 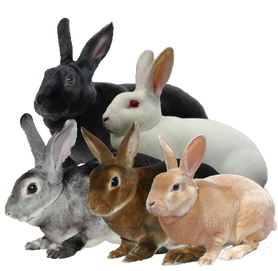 COLOUR AND MARKINGS: All colours as per Mini Rex Standard. BROKEN BLANKET PATTERN: To have both ears completely coloured; white at base is permissible. Colour to head to match the body colour, which can be solid or with eye circles and with evenly balanced nose spots. The body markings to be blanket pattern with colour starting at the shoulders and continuing over the back, sides and hind quarters. Preference should always be given to an evenly balanced pattern. Colour spots are permissible to the legs, belly and to the genital area. Total colouration should not be more than 60% of the body area, this cannot be less than 40% white. FAULTS: More than 60% colour and less than 40% white to the body is to be considered a major fault. Not enough colour to cover shoulders, back, side and hind quarters. Pattern on head/muzzle not balanced. WEIGHT: As per Mini Rex Standard. 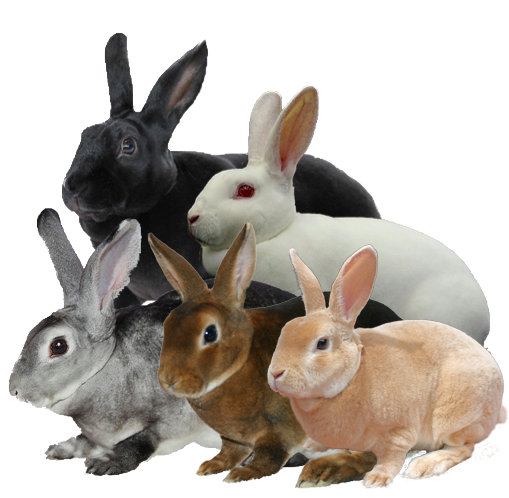 DISQUALIFICATIONS: As per Mini Rex Standard and an absence of colour to either ear, i.e. white patches.